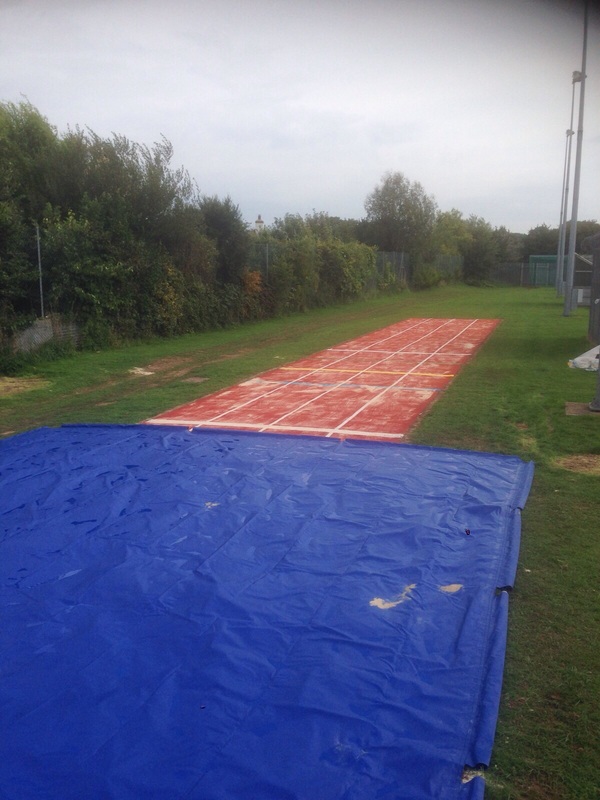 We offer an extensive list of triple jump services, including building new facilities and carrying out maintenance to current surfaces. This is available for many clients and we often work with schools, colleges and sports clubs. 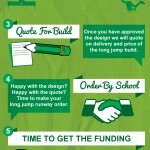 There are a number of designs to choose from and you can customise the final project to suit you. Feel free to contact our experts via the enquiry form if you need any more information. Just tell us which service you need and we’ll get back to you with some advice on the costs. If you have a budget in mind please let us know so we can work our prices around this. What is a Triple Jump Runway? 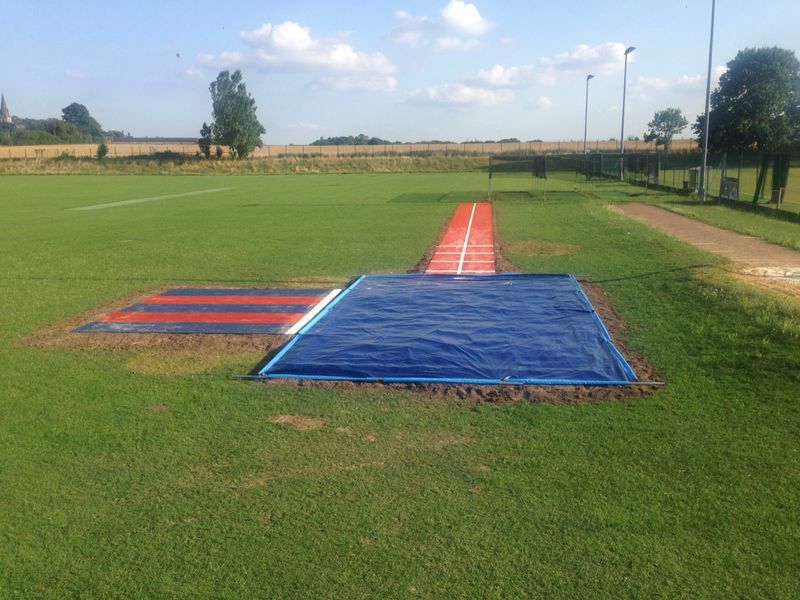 A triple jump runway is an athletics facility which is often found at sports clubs and schools. 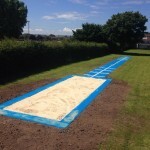 It usually comprises of a run up track and a sand landing pit, and these can be fitted in many different sizes and shapes. Professional training facilities may be installed in larger area sizes, whereas a smaller more compact facility could be perfect for a school sports track. 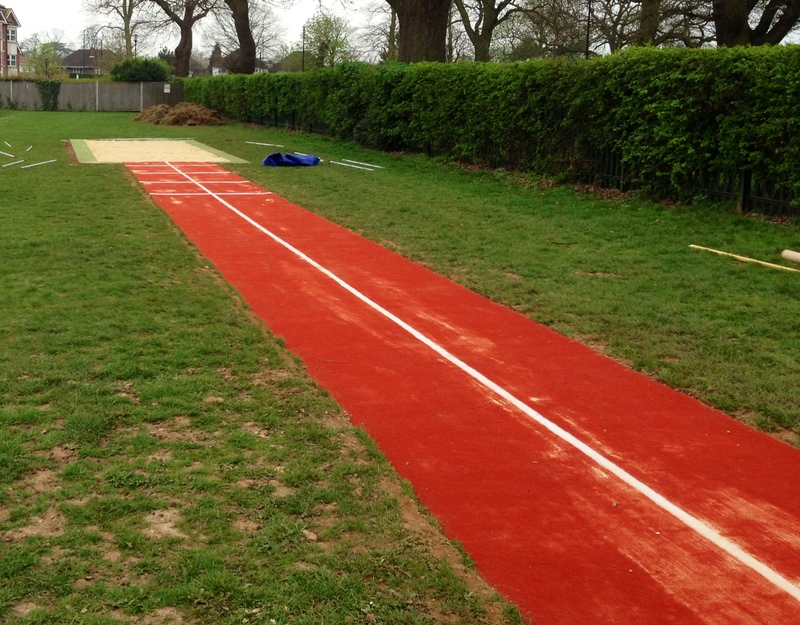 The different triple jump surfacing we offer includes a polymeric rubber specification and a synthetic turf carpet. We would generally recommend the rubber flooring for a club standard track, whereas the artificial turf is ideal for recreational use. 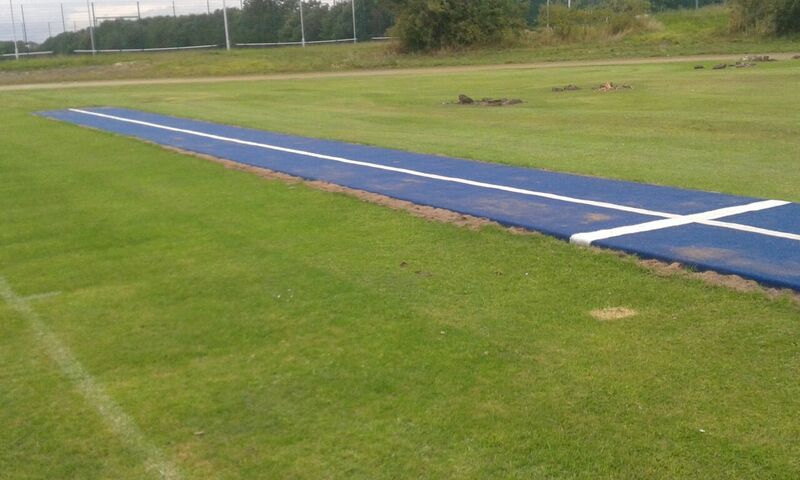 We install athletics runways across the country for schools, colleges, leisure centres and athletics clubs. 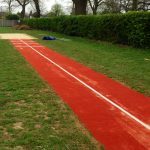 We can tailor the triple jump construction process to make the surface either suitable for competitive or recreational use, making the price more flexible for institutions on a tight budget, this allows schools to give their students an opportunity to try something new. This video below shows a multipurpose run up being build at a school. Our expert team completed this work, carrying out the full groundworks and fitting the runway surfacing and sand landing pit. We also then make sure once we have installed the facility, or if someone has an existing facility that is becoming worn down, to offer them an extensive maintenance scheme to ensure they get the best out of their surface. Through a thorough maintenance scheme, you can also make sure that the surface is completely safe, this is vital for schools as they have to take full responsibility for the children using it; this makes maintenance an extremely important part of the services we offer. 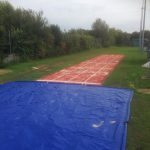 Another main service we offer is the full cleaning of the athletics surface, this similar to maintenance and is an extremely important part of triple jump services as it ensures that the product life of the facility is greatly increased, and also makes sure that the flooring is safe for those using it. 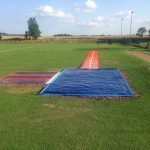 We are able to supply a specialist triple jump sand pit cover which is designed to keep the landing pit free from dirt when it is not in use. Having this helps to reduce the need for a lot of maintenance work, and prevents the pit from getting contaminated. 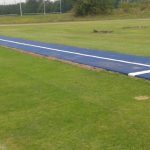 The triple jump services maintenance costs may seem irritating and a waste of money to some, but through a regular and intense maintenance and cleaning scheme, the longevity of a sports surface is greatly increased. The safety of the area is also much better; this is a key aspect to take into account for those who intend to rent out the facility or let children use it. Any project should take into account the costs for maintenance as they really are a key part of the surface’s life. We aim to offer the best possible products and services at the greatest value for money; this ensures happy customers with great facilities that are both safe and long lasting. The prices for this kind of work will vary depending on the size and specifications of the flooring, as the construction of a larger running track would be more expensive than a smaller one. We can help you have control over costs by offering different specifications and designs to help create the perfect surface for you whilst making sure you remain within your budget. This could be a more extensive sand pit cover system for those willing to spend more to look after their facility. If you are struggling the find the budget for this work, you may be able to apply for a grant. Some schools and clubs are eligible for triple jump funding to help cover the costs, so this may be something you could look into. We’ll always try to make the costs as affordable as possible, but our prices will depend on the nature of the work that needs to be done. You can get more information on all of our products by filling in the contact form on this page. One of our experts will get back to you and provide all the details you need regarding costs and specifications. If you need any more advice on the services that we offer, don’t hesitate to ask. We have worked on countless triple jump services around the UK so we can show you plenty of case studies for previous work. 1 What is a Triple Jump Runway?